As I’ve said before clothes shopping is hard but shoe shopping is harder. Clothes shopping I love, shoe shopping I hate. Well, actually I take that back. I love wondering around shoe shops if I’m just doing it to pass an afternoon, but I really hate trying to find some to buy. Most of the time, I’m supposed to wear special shoes (like the ones in this photo). As you can see they have holes in the side that my callipers slot into and insoles inside them to help me walk. Sometimes I break the rules and put on something that bought myself from a normal high street store. I don’t do this very often but if the boots or my callipers have been rubbing my feet and legs it’s just nice to have a change in pressure points. I scrape my shoes along the floor when I walk too so I wear the toes out quite quickly so when I see something in a shop that’s suitable for me and fits, I often buy in bulk for “just in case” days. Finding something to wear is a challenge though, because there’s way more types of footwear that I’m not allowed to wear than things I can. I’ve never worn a flip-flop, slip on shoes fall off me because of the way I walk, and high heels are a no-go for so many reasons. This pretty much limits me to boots and trainers. Even then I have to find ones that offer me enough support around the ankles, don’t come off at really inappropriate times and that I can actually balance in. Oh, and then there is the small matter of shoe laces. I think it’s fair to say that when it comes to hunting out that new bit of glam for my feet I have a very specific criteria. A lot of my friends, both disabled and able-bodied, male and female, tell me that they all too have their own set of needs and I’m not alone. Some hate stilettos, others dread buying trainers and a few hate trying to find something they can wear to work. In my head I know that I too would probably avoid anything with a heel over an inch anyway and I personally think that flip-flops look really painful on your toes, but it’s the fact that I know I can’t wear them that makes me drool over them all the more. It’s kind of how I imagine it feels to give up chocolate. The first pair of shoes I think I remember getting that I didn’t wear with some kind of splint that I thought was special were a pair of white and silver dolly shoes that I was allowed to get for a family wedding. Because they had elastic straps going over the top we knew they’d stay on. I was really excited and spent the whole day telling anyone who’d listen about them. My last shoe purchase this year was back in January and they were a pair of red and black trainers. I don’t wear them often because I can’t get them on by myself and I don’t want to wear them out too quickly like I do with all my others. I may not be able to buy many pairs, but I more than make up for this with my bag collection, which is huge. I learned long ago that the secret to good shoes is to spend good money on them, unfortunately. I found that when I bought cheap shoes, they were uncomfortable, and thus never got worn. Dearer ones fitted better, were more comfortable and actually left the house on the ends of my legs occasionally. I hate shoe shopping as it is so often difficult to find comfy shoes, or even the type that I am after. Your black and red trainers sound lovely – my favourite colour combination. I agree. I think it’s better to spend a little more money less often to get better quality and somehing that you actually like and will use. It’s quite nice to know that I’m not the only one who finds it hard. And if you think shoe shopping is hard, you should try shopping for a new mattress! They rival each other in awfulness!!!!! I’ve yet to have that joy but I can imagine it’s awful! couldn’t agree more!! shoe shopping + cp = nightmare!! I have to take into account so many factors when looking for shoes such as: how tough they are so I don’t wear them out in seconds, will my splints go in them, how supportive they are when I’m not wearing my splints and finding ones that fit my odd shaped feet!!!! I ve gone through life wearing the standard hospital issue piedro boots as alot of people with cp have. I still wear them as they are really supportive when not in my splints and easy to get my splints in so I don’t have to buy different sized ones like other shoes – the only thing is they are so expensive as the hospital won’t supply me them as I wear splints. I also find skate type trainers really good for splints. I went through all that when I had AFO splints. A lot of the time I couldn’t wear them though because they blistered my feet so much. I had peidro boots for the times that I couldn’t wear my splints. Now that I use callipers instead I have piedro boots with holes for them to slot in. I found that skater trainers (especially Etnies) to be a godsend when I had AFOs. I’ve found piedro boots a godsend, they are slowly bringing out better styles!!! 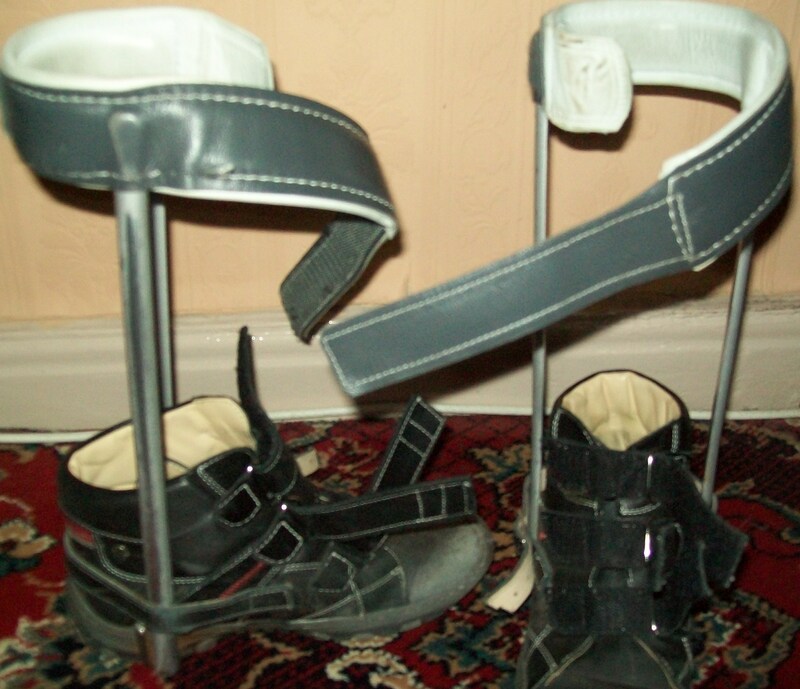 Pingback: viewfromawalkingframe | I think I need new shoes….